In the winter of 2013 filmmaker Chris Galloway set out to thru hike the Appalachian Trail starting on Springer Mountain, Georgia and walking over 2,000 miles to reach Mount Katahdin, Maine. In the course of his seven month trek, Frost (as he came to be known on the trail) trudged through deep snow drifts on the Smoky Mountain crest, savored a brief Appalachian spring, and battled clouds of mosquitoes in a record-breaking rainy summer. He experienced grief, growth, and triumph, from the joy of getting engaged to the pain of a family tragedy. Along the way he formed deep bonds of friendship with other travelers making their own journeys on the trail. The Long Start to the Journey reveals the Appalachian Trail through the lens of one man’s journey across it. It is a personal narrative that also digs deep into the history of the A.T. — the vision and values that inspired generations of volunteers to build this iconic trail. This is a story of the impact that the A.T. has on those who walk it… of why wilderness is something essential for humans in the modern world. Disclosure: I participated in a crowdfunding campaign sponsored by the Appalachian Trail Conservancy to help get this film financed. Chris and Larissa Galloway worked tirelessly for more than two years to make the end result happen. Perhaps his 2,000 mile hike was the easiest, and most relaxing part of the endeavor. One of the things that appealed to me about helping to fund this project was that Chris Galloway is a local boy, a writer, photographer, and filmmaker based out of Black Mountain, NC. He started out telling river stories with his award-winning film The Green Race Movie, a documentary about a class V kayak race in the mountains of North Carolina. Taking a quiet, patient approach to filmmaking, Chris is drawn to stories of creativity, culture, and outdoor adventure. His independent production company Horizonline Pictures has produced work for clients ranging from summer camps to tech startups to some of the largest brands in the outdoor industry. Here he is on day 1 at Springer Mountain. Larissa Galloway, known as “Sunshine” on the trail, is a two-time A.T. thru-hiker (2004 and ‘05) and currently works as a nurse in the NICU at Mission Hospital in Asheville, NC. While supporting Chris on his hike, Sunshine covered over 350 miles of the trail with him, helping to document the journey and providing valuable insight and advice along the way. When not visiting Chris on the trail, Sunshine was content-manager for the production, downloading memory cards as he shipped them home, then returning them by mail with letters and chocolate. Phil Moore is the front man for the band Bowerbirds. He and his partner/co-creator Beth Tacular live in a cabin they built in the North Carolina woods where they work on music, art, and raising their new baby boy, Autry. Phil wrote original music for The Long Start to the Journey, and he created a selection of songs that add a rich bed of emotion and intrigue beneath the storyline of the film. Recent major motion pictures like Wild and A Walk In the Woods have brought national attention to America’s long distance trails. They are both fun and intriguing stories. The thing is, though, the protagonists in each of those stories never actually completed their respective trail. Sure, they traversed long portions, but neither knew the complete set of emotions that must be mastered by those who finish what they start. Chris Galloway is one of those finishers. That should not be minimized. The long green tunnel through Shenandoah National Park. Chris took the time to explain the history of the Appalachian Trail. From the ideas and imagination of Benton MacKaye, to the sweat and blood of Myron Avery and the many thousands of volunteers that built and maintain the A.T., this is perhaps the most successful volunteer project in the history of our great country. Still a young man, Chris issued a call to action for those of his generation to become more involved, noticing along his journey that nearly all of the volunteers were of middle age or older. The film itself is more about life’s journey, not just the trail. Sure, you’re taken through each of the 14 states traversed by the A.T., but videologs are a dime a dozen. With Galloway’s direction and narration, we the audience are led to understand a number of truths. Even if you never go to the wilderness, it is essential just to know it is there. The trail, and its people, lead you to conclude that age, race, gender, and economic status are of less importance. There is truly very little in life that we need, and that family and friends are first among them. Whether it be visits from family at strategic points along the trail to help boost sagging spirits, or new companions that become life-long friends, the trail provides certitude. Trust on the trail is immediate. It does not come so easily in civilization. Those people you survive the trail with become extremely close to you. They intuitively know you, understand you, feel everything you feel. Starting his quest in early February, a month earlier than most thru hikers, Galloway experienced the worst of what can be found along the Appalachian Trail as well. Weeks of snow and winter weather through the Great Smoky Mountains, rain seemingly everywhere as spring turned to summer, and the agony and torment of New England mosquitoes. Throughout it all, for the most part he managed to maintain a positive attitude and see the experience for what it was, “Seeing oneself as who you feel like you are and who you want to be.” It can fill even the most demure introvert with supreme confidence. Thru hiking has a way of drawing people in a transitional period in their life. For Chris, the change was from twenty-something to mature adult, and from bachelor to married man. While in Virginia, famous for giving thru hikers the blues because of the length of the A.T. within the same state, Chris came close to quitting because of pain and suffering from blisters and a bad ankle. Digging deep into his inner reserve, he gutted out the discomfort and never quit. Marketeers will also tell you that Virginia is for Lovers, and so it was on the night at Grayson Highlands where Chris proposed to Sunshine. 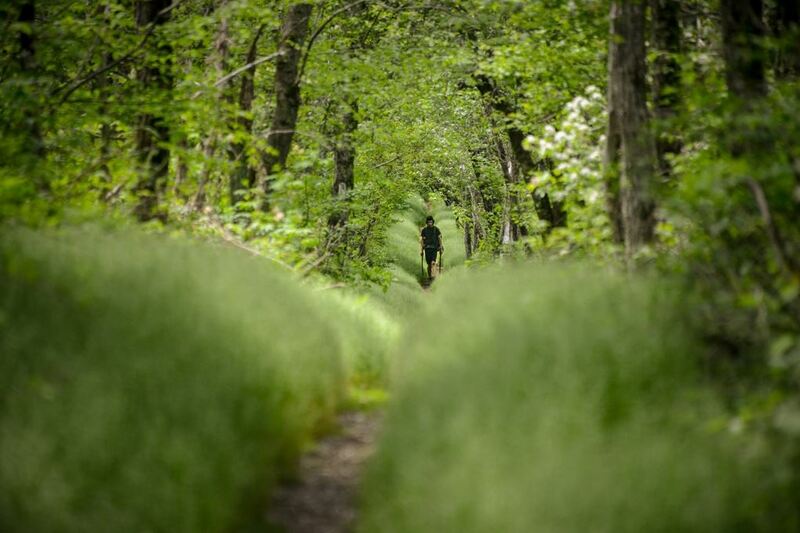 Once he reached Vermont and New Hampshire, Chris had the most time of his trek completely to himself. He learned to love the quiet. He described the silence as beautifully as his surroundings. He also described a sense of bewilderment, knowing how much he and his life had changed. The Appalachian Trail isn’t a magical cure-all for our problems. It is, after all, just wilderness. But therein lies the perplexity. It is just wilderness, but it is also ever important wilderness, undeniable wilderness, absolutely necessary wilderness. It is a gift. Chris Galloway and his family had a glorious reunion and well-earned celebration when he arrived at Mount Katahdin seven months after he started his journey. He had endured a lot, including unspeakable tragedy. He had discovered a lot: about our nation, about the trail and its people, and about himself. As he concluded, “If you go to enjoy the beauty of Nature, and to slow down, you may come away with much more than you looked for.” As the title of this very fine film describes, Chris also realized that he was just at the start of life’s journey. The Long Start to the Journey is available from TheATMovie.com on DVD for US$18 and on BluRay for US$25. In my mind, that is a bargain for the entertainment value. I thoroughly enjoyed the presentation, finding myself smiling any number of times, as well as feeling the cold, feeling the pain, and finally feeling the conquest. I would be remiss if I didn’t also mention the compelling score by Phil Moore. The songs are what I hear when I’m sitting beside a crystal clear mountain stream, or standing on the tallest pinnacle peering as far as my eye will take me. Moore captured the essence of the wilderness. The Long Start to the Journey is a fine example of living vicariously through others. If you can’t thru-hike yourself, do it from the comfort of your living room by watching this film. You should at least get some ideas for great day hikes or section hikes, and a deeper appreciation for the level of endeavor and accomplishment by those who find their own journey on the Appalachian Trail.